Trail Heroes, a photo by The Bacher Family on Flickr. Here's another blast from the past, selected because it's one of the inaugural images on Mount Rainier National Park's new Flickr site! Check it out at www.flickr.com/photos/MountRainierNPS. You can also contribute your own photos to the official Mount Rainier National Park Group at www.flickr.com/groups/MountRainierNPS. In November of 2006, 18 inches of rain fell on Mount Rainier National Park in 36 hours. The resulting floods devastated roads, trails, and campgrounds throughout the park. Mount Rainier's main entrance road was closed for six months during the repairs. Some of the first to return were volunteers, who contributed more than 80,000 hours of work to the park in 2007. 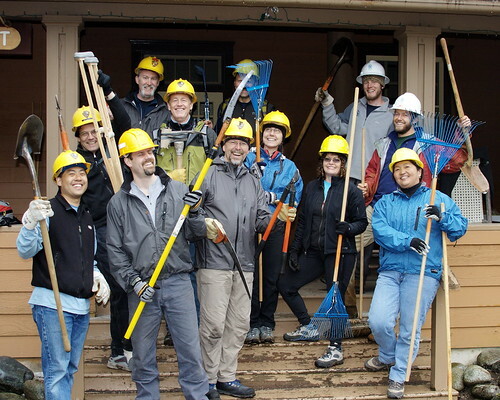 This was our first volunteer group of the year, a team of REI employees who did general maintenance on the Trail of the Shadows and, more importantly, symbolically kicked off the Mount Rainier Recovery Project. They were led by crew leaders (in white hats) from the Student Conservation Association.